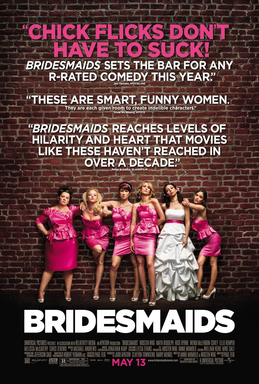 This is a movie that’s introduced the world to many talented funny actresses, but it also ended up being one of the best modern comedies in recent years. Lillian (Rudolph) is getting married and asks her longtime best friend Annie (Wiig) to be her maid of honor. Annie doesn’t exactly have her life together so she’s intimidated when Helen (Bryne) comes along. Helen’s married to Lillian’s fiancée’s boss, so they spend a lot of time together. There’s also 3 other bridesmaids, each who have awesome comedic timing. The gang all go through various hilarious and memorable incidents along the way. There’s really no other film out there that portrayed weddings in such a hilarious fashion. Most of the other movies on the subject are more romantic comedy than straight up comedy. While this one does have it’s fair share of romantic elements to it, it does seem more focused on the comedy part which says a lot about the originality of the plot. Kristen Wiig, who also starred in the film, wrote it as well and she clearly has really original and decent ideas that show through both her writing and acting ability. Kristen Wiig and Maya Rudolph were beyond convincing in their roles as two best friends. Probably because they are close in real life as well and were on Saturday Night Live together. Despite their great performances, the supporting characters really stole the movie in certain scenes. One scene that always makes me laugh is when Annie is on the plane and comes on the intercom saying, “There’s a colonial woman on the wings! There’s something they’re not telling us!” which then scared all the passengers. This is a great moment for Annie, but Melissa McCarthy swoops in and is just as hysterical as Wiig. Rose Bryne was also funny as the mean and perfect elitist Helen. This also introduced us to Rebel Wilson before her Pitch Perfect fame, as Annie’s weird roommate who reads her diary. She says, “I thought it was just a really sad book,” as her defense for reading it. There’s just not a bad character in the film who doesn’t make you laugh a little bit throughout the film. Paul Feig is more commonly known for his writing for TV, but he’s also directed some popular female led comedies in recent years. This trend started with Bridesmaids, which is definitely one of his best. This film doesn’t focus much on the surroundings, besides the wedding and the rich mansion Helen lives in. It focuses more on the characters, which is where the film truly succeeds. I love this movie, I could watch it over and over again and still find it funny. It may not be one of the best movies ever made, but the general characters and comedic timing is just brilliant. It’s one of those films that just worked, and the chances of another working in the same degree are probably not that likely. This is a great movie to turn to when you’re in need of a good laugh!